Teleportation - Look Ma, no signal! (PhysOrg.com) -- Scientists in China have succeeded in teleporting information between photons further than ever before. They transported quantum information over a free space distance of 16 km (10 miles), much further than the few hundred meters previously achieved, which brings us closer to transmitting information over long distances without the need for a traditional signal. Quantum teleportation is not the same as the teleportation most of us know from science fiction, where an object (or person) in one place is “beamed up” to another place where a perfect copy is replicated. In quantum teleportation two photons or ions (for example) are entangled in such a way that when the quantum state of one is changed the state of the other also changes, as if the two were still connected. This enables quantum information to be teleported if one of the photons/ions is sent some distance away. In previous experiments the photons were confined to fiber channels a few hundred meters long to ensure their state remained unchanged, but in the new experiments pairs of photons were entangled and then the higher-energy photon of the pair was sent through a free space channel 16 km long. 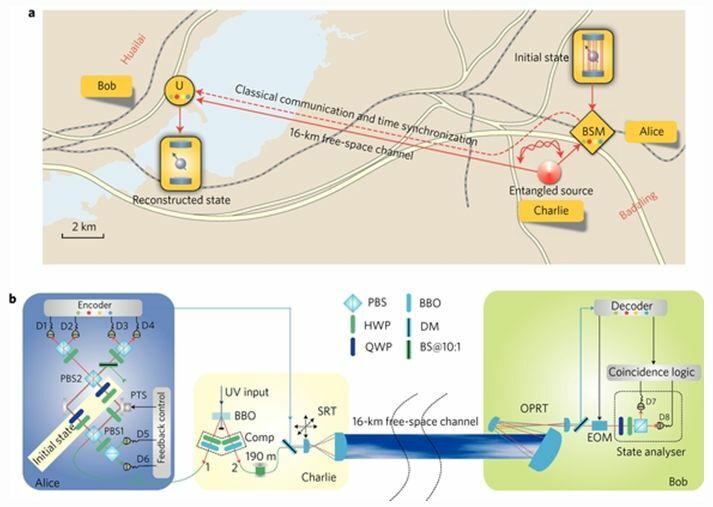 The researchers, from the University of Science and Technology of China and Tsinghua University in Beijing, found that even at this distance the photon at the receiving end still responded to changes in state of the photon remaining behind. The average fidelity of the teleportation achieved was 89 percent.